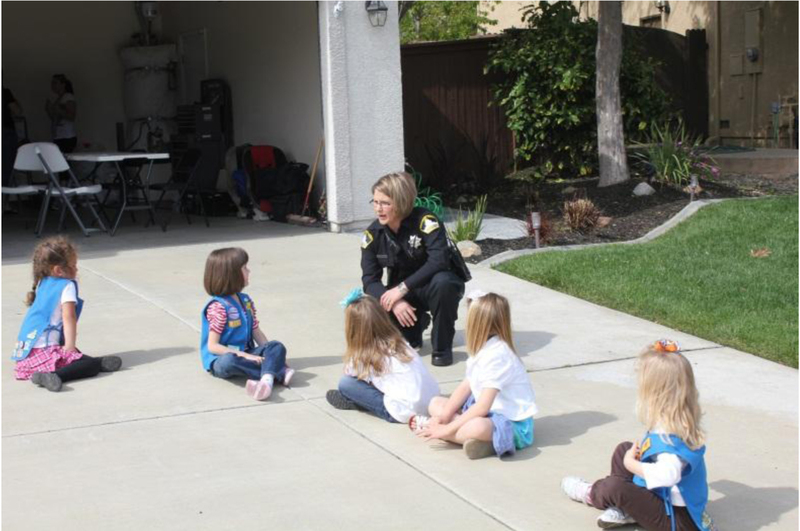 Roseville Girl Scout Daisies had the pleasure of meeting Sacramento County Deputy Sheriff Aimee Eagleton on April 16. Fresh off a visit to the local firehouse, the troop learned all about authority and respect from the veteran officer. “The police, firefighters and teachers are just some of the many people who are here to help children,” Deputy Sheriff Eagleton said. Having graduated from the academy in 2005, Eagleton was an inspiration to the girls, exhibiting the idea that American females can do whatever they set their mind to. Learning about authority, emergencies, respect and safety, the Daisies got to examine the police interceptor and its communication, computer and tracking systems, as well as crawl through the back seat where those in police custody are transported. Lifting each Daisy to see the aerial identification number emblazoned across her shiny interceptor’s roof, Eagleton explained one of her favorite parts of the job: “…know[ing] you have truly made a situation better for someone, no matter the circumstances.” This nobility of purpose as well as the fraternity of law enforcement—revealed by the black ribbon draped across her seven-pointed badge in honor of slain Modesto P.D. Deputy Bob Paris—was not lost on the troop or their dedicated leaders, Kristin Crossman and Stacey Garcez. Girl Scout Daisy Troop 1710 gives a hearty thank you to Sacramento Deputy Sheriff Aimee Eagleton and the Sacramento County Sheriff’s Department, both for taking the time to share about this important job and for keeping Roseville safe for law-abiding citizens. Roseville Girl Scout Daisy Troop 1710 learns about authority, emergencies, respect and safety.